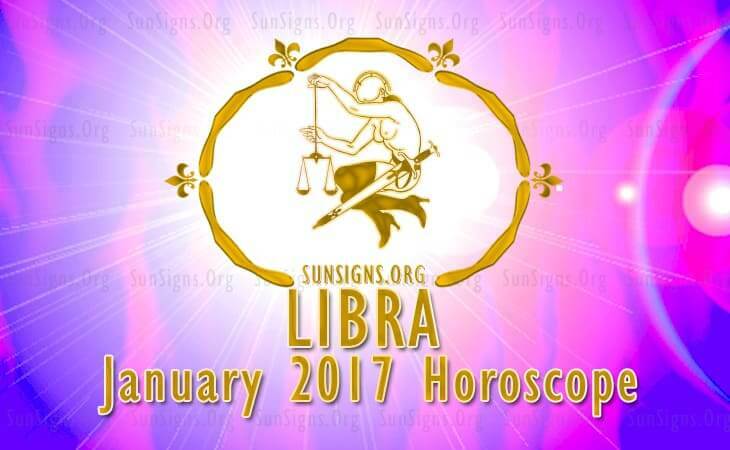 January 2017 Libra Horoscope foretells that emotional issues and domestic concerns will be on top of the agenda this month. The House of Career is also strong and you should learn to balance your family matters with career objectives. The horoscope 2017 predicts that life will be frantic and active for the Librans in January 2017. It is important that you work smarter and take care of your health so that you will not lose your fitness. Also, in January 2017 social intelligence will be more important in achieving your goals than independence and hard work. The Libra personality is happy to operate this way. Career will be hectic for the Libra zodiac sign in January 2017. In spite of your preoccupation with family matters, you will need to devote time to your business or job. The Libra 2017 monthly astrology predicts that your financial position is excellent this month. With the beneficial aspect of Jupiter, money flows in plenty, but some effort is needed. Situation becomes better after the Mercury Retrograde of January 2017. Stock trading and artistic ventures will yield sound returns. You tend to spend money buying luxury items. Libra, you will have the support of your spouse and social contacts in your monetary ventures. Money can be made with your intellectual capabilities and by sales promotion of your products in the January month of 2017. Love is favorable for single Libra born this month in January 2017. They can find romantic partners while working on financial ventures, in academic institutions or in close quarters. Socially you will be fully engaged and your partner will be an active part of your social activities. Family matters are a bit volatile and may prove a dampener for your social pleasures. After the 20th, new avenues of entertainment will spring up for single Librans. Marriage compatibility for Libra couples will be excellent with good chances of pregnancy. Health of Libra zodiac people in January 2017 is subject to extreme stress because of frenetic lifestyle. Rest and relaxation using music therapy or mindfulness will help you to face life’s challenges. The Libra horoscope predictions for January 2017 suggest a month of action and achievements.